Ever wondered what goes on in the University of St Andrews? Bright Club brings current research to the stand-up comedy scene. Bright Club is the place where public engagement and stand-up comedy collide. Academics and researchers - most of whom have never done comedy before - take to the stage to perform an 8 minute routine about their area of expertise. Following successes in Edinburgh, Dundee and other cities around the country, Bright Club is coming to St Andrews. That's right, Bright Club St Andrews is returning for the new academic year with a fabulous new show on the 30th October, at the new Sandy's Bar pub venue in the Student Union (at the back of the main bar). 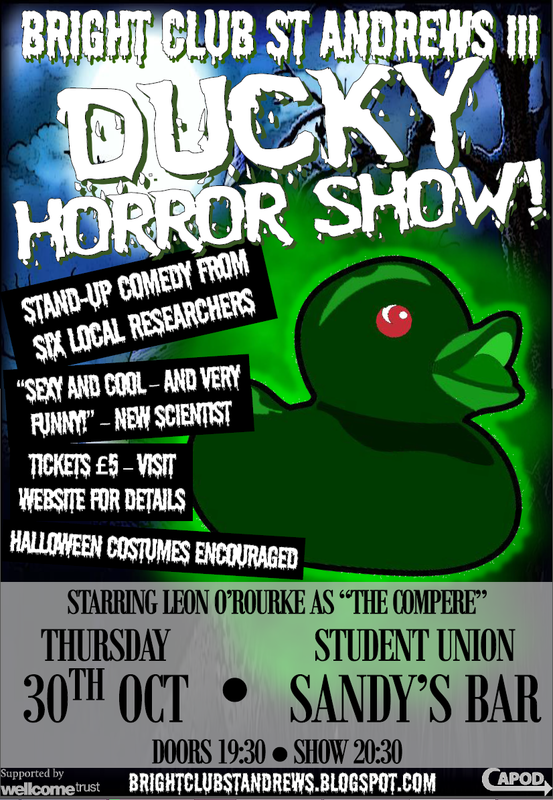 Hosted by Leon O'Rourke with a lineup of six funny researchers, it's sure to be a fun night! We fully encourage the donning of Halloween costumes. Tickets available for £5 (+50p booking fee) from here. Get them now to avoid disappointment!